How easy is it for innocent men to appeal their convictions? It is a tragedy when an innocent person is tortured over wrongful accusation, much worse when convicted and sent to prison for it. The story of the innocent leader of the Indigenous People of Biafra (IPOB), Nnamdi Kanu, who has been languishing in Kuje prison for one year, despite being asked to be released unconditionally is quite a pathetic tale; one that boggles the mind and prompts people with conscience to begin to query the sanity of the tyrant in Aso Rock, Muhammadu Buhari. October 14th, 2015, Nnamdi Kanu, the leader of IPOB was kidnapped by the Department of States Security, DSS in Lagos on his way back from his base abroad. Thereafter Kanu was arraigned over allegations of Phantom treasonable felony charge, for which he pleaded and was found not guilty by Justice A.F.A Ademola and was subsequently granted bail, discharged albeit unconditionally. The said order is yet to be obeyed till date because the dictator/Head of State, Muhammadu Buhari, vehemently refused to let him go thereby opposing the rulings given by the Court. Since that very day, the judiciary lost her pride and had its power truncated. Buhari has countlessly reiterated on and off air before local and foreign media that "I will not release that boy (Kanu)". He stupefyingly cited Kanu's inexperience of the civil war as a reason for holding him captive. Nnamdi Kanu is a freedom fighter and human rights activist. He willingly accepted the mantle of championing the restoration of Biafra as a sovereign nation, bestowed upon him by his people; fighting this noble cause in a civil manner without instigating war. Remember, right to freedom of expression is inalienable. Self-determination is legitimate, and even the Nigerian government is a signatory to it in the UN charter. Therefore, the violation of the fundamental human rights of the Prisoner of Conscience, Kanu, is unlawful, unconstitutional, malicious and an abuse to his person. Nnamdi Kanu has been the voice crying in the wilderness, cleansing away all the lies that has clotted the minds of Biafrans, courtesy Nigeria and Britain. Nnamdi Kanu alerted the world of the implication of allowing a coup-plotter to become a president in a democratic dispensation, he explained the danger Buhari portends to Black Africa but it was tagged 'hate speech', but now all eyes are now opened to reality that has befallen humanity in guise of CHANGE. The only reason why Nnamdi is still being held extra- judicially is because he has vowed to continue preaching same gospel of freedom, even if it leads to his death and this is what Buhari considers a threat. The innocent are convicted far more frequently than the public cares to believe, and far more frequently than those who operate the system dare to believe. An innocent person in prison, in my view, is about as rare as a pigeon in the yard. The aim of this article is to concisely delineate how this phenomenon of the "convicted innocent" is so alarmingly widespread in the lawless entity of darkness - Nigeria. The case of Nnamdi Kanu is a clear illustration. Permit me to ask these questions, but correct me if I'm wrong. Can only one man betray one's government? Can only one person commit treason without the use any lethal weapon? I guess treason is committed with just the use of the mouth and a mic, which apparently seem to be the only major tool that was found in Kanu's possession as at the time of his kidnap; that is what Buhari considers a 'weapon' . Nevertheless, all these baseless allegations against Kanu by Buhari has been cleared; but the question remains, why is Kanu still in prison despite calls from different quarters for his release, most recent being that of Julie Ward (MEP) of the EU Parliament, who condemned the unlawful detention, while still urging Buhari to respect Nigerian constitution and release Kanu and his co-accused? The continued detention of Nnamdi Kanu for a whole year by the Buhari-led government could spell doom, as it is bound to trigger an escalated violence within the British contraption. It is illegal and an assault on the judiciary which is the third arm of government, which even the executive arm (Buhari) is answerable to. Buhari is on a mission, one that is dangerously glaring to be considered as inconsequential. There is a limit to impunity, but alas! Buhari's impunity knows no bound. The Judiciary which happens to be the last of hope of the common man is now at his mercy. His latest victims are the upright judges who vehemently stood their ground in opposition to his tyranny. Justice A.F.A Ademola the former presiding judge of Kanu’s case is being witch-hunted for going contrary to his wish to keep Kanu in detention, justice Nnamdi Dimgba is not being spared of his madness for displaying so much temerity and ordering Buhari’s dogs, the DSS to obey court orders. We all know that the only people sharia needs to be imposed upon are christians in the contraption, and unfortunately they are predominantly Biafrans, and that is why Nigeria must break up. Just like Buhari cannot and will not stop his agitation for the total Islamization of Biafrans, same way IPOB can never stop her agitation for the total restoration of Biafra. 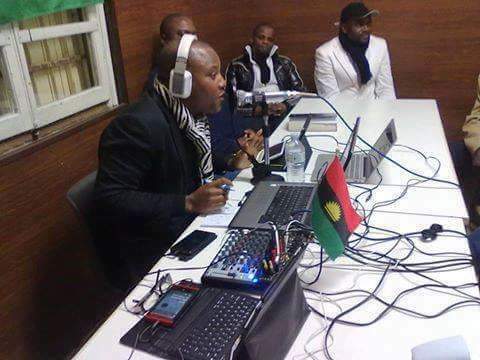 We will not beg for our freedom; IPOB has come to take what is rightly hers and Buhari’s tyranny will eventually work in our favour; as the whole world is now attesting to everything Radio Biafra has been airing through Nnamdi Kanu as truthful. A subborn fly will definitely follow a corpse to the grave; Buhari is that very stubborn fly that is six (6) feet bound. He threatened suicide in advent of Biafra and we are duty bound to oblige him, because his worse nightmare will soon become a reality. We are counting down to Buhari's dooms-day and behold it has come. IPOB must keep faith with Nnamdi Kanu who has shown so much guts and bravity in the face of adversity. Remember, the tougher the pain, the sweeter the glory.